DESCRIPCION CORTA: ¿¿2.4 GHz Control System¿ --- With 2.4GHz transmitter; you'll never get any radio interference with this electric car. It is ready to race. 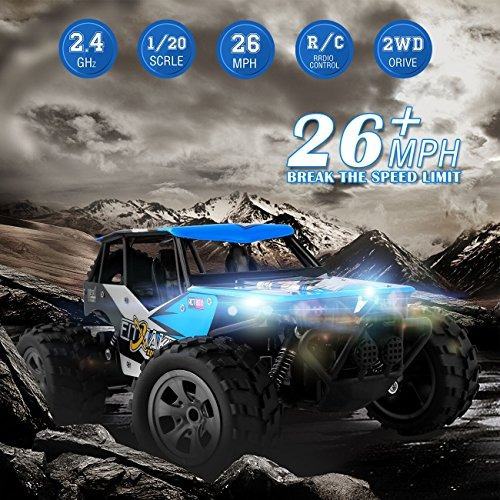 ¿ ¿All Terrain RC Car¿ --- No problem running on carpet, tile, the open road, grass, puddle, mud, etc. Easy to finish and enjoy lots of difficult movement. 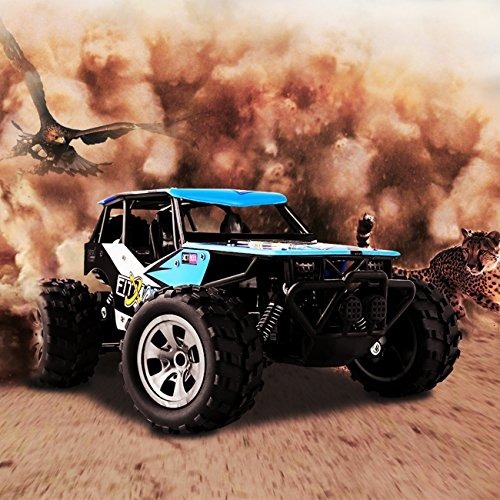 Great gift for experienced RC enthusiasts or kids! ¿¿Easy to use¿--- Pistol Grip Style Transmitter. Full function of forward/reverse/left/right and stop. Pistol Grip Style Transmitter make it easy to control even a 5 years kid. ¿¿Strong anti-collision structure¿ --- The four wheels consist of bouncing spring materials which give support to unexpected dropping and the unstable surface of the ground, make you enjoy the toy car for a longer period of time; Four-wheel drive and full four-direction control also enable actions like racing forward or backward and turning left or right. ¿ ¿20 mins Battery Life¿ --- Included USB charger gives you the convenience of charging. A bottom loading battery compartment provides you with easy access to the battery without removing the body and spoiler.